IELTS - International English Language Testing System - is an English language proficiency test. It is the English test most often taken by those wanting to work, study or migrate to Australia or other English-speaking countries. What is tested in IELTS? There are four main skills tested on the IELTS exam, and each skill has its own section: Listening, Reading, Writing and Speaking. The whole test goes for 2 hours and 45 minutes. The Listening, Reading and Writing sections are all completed in one sitting (i.e. together). The Speaking section can be completed on the same day, or 7 days before or after (depending on your location). 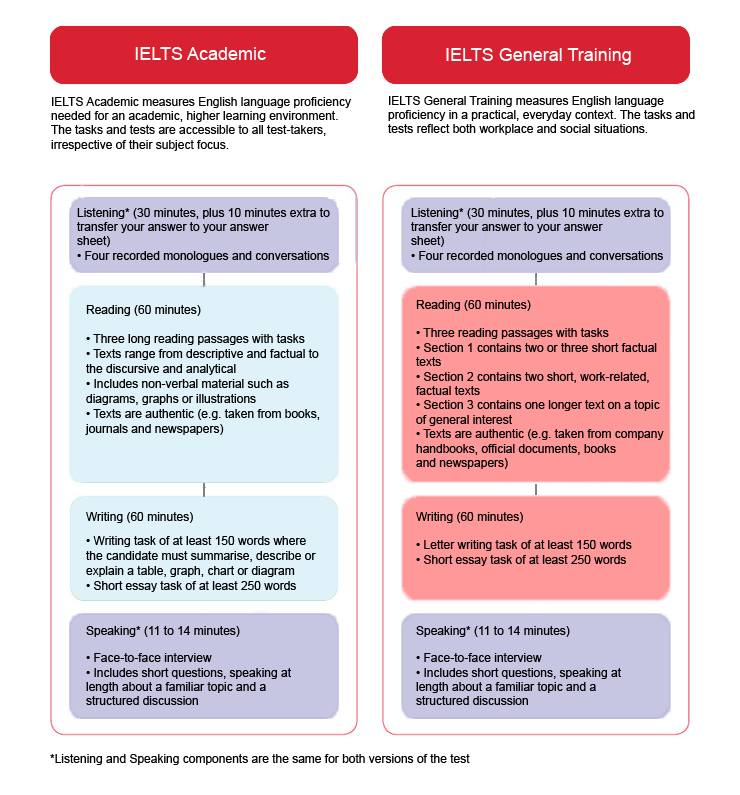 How is IELTS Academic different from IELTS General Training? Both the Speaking and Listening sections are the same, but the Reading and Writing tests are a bit different (see diagram below). IELTS Academic is for people who want to do tertiary study (i.e. university) or professional work (e.g. doctors and nurses) so it tests more academic English skills. The IELTS General Training format is usually for those who want to migrate to or work in an English-speaking country, or study at below degree level. So the General Training format tests more general, practical English skills. Professional or tertiary study? - IELTS Academic. Migration, work or non-university study? - IELTS General Training. Are you ready to begin your IELTS training? Now that you understand the structure, are you ready start your IELTS preparation course? As with any exam on any topic - science, history, maths, etc. - in order to get the best score it is essential to study! The best way to do that is to join an IELTS training course with English Key in Melbourne. Our school has helped students get their scores and achieve their best in English - come in and see us today! CHECK OUT PAST STUDENT RESULTS HERE! Click here for an a more thorough explanation of the tasks on both IELTS Academic and General formats.